I’ve been delivering Meals on Wheels for about 10 years now, first in Solon and now in Cleveland Heights. As much as I love to check out the latest restaurant and take in all the great food Cleveland has to offer, I am also aware that there is a percentage of the population who do not have that luxury. Millions of seniors nationwide are struggling with hunger, isolation, and the ability to pay for basic living needs. One in six of our seniors struggle with hunger. Meals on Wheels is a program that delivers meals to individuals at home who are unable to purchase or prepare their own meals. The name is often used generically to refer to home-delivered meals programs, not all of which are actually named “Meals on Wheels”. Because they are housebound, many of the recipients are the elderly, and many of the volunteers are also elderly but able-bodied and able to drive automobiles. Meals on Wheels originated in the United Kingdom during the Blitz, when many people lost their homes and therefore the ability to cook their own food. The concept of delivering meals to those unable to prepare their own evolved into the modern programs that deliver mostly to the housebound elderly, sometimes free, or at a small charge. MOW America started in the U.S. in 1974. The first program began in Philadelphia, and Columbus, Ohio was the second city in the U.S. to establish a community based meals program. In 2016, Meals on Wheels provided approximately 218 million meals to 2.5 million Americans. Approximately 500,000 of the recipients are veterans. The annual meal cost is $2,765. No one is turned away from Meals on Wheels due to inability to pay. The cost for meals is based on a sliding scale, and the staff works with the client to determine an affordable fee based on the senior’s gross monthly income minus certain expenses. Meals on Wheels also accepts SNAP (food stamps) for payment. Our seniors pay about $1.35-5.00 for each delivery day. They receive one hot meal and one cold meal. Dietary issues and food preferences can be taken into account. For example, one client in Solon hated wheat bread, and it was marked on the delivery sheet. Also, diabetic meals with a diabetic-friendly dessert are labeled accordingly. One gentleman gets a frozen meal delivered with his hot and cold meals, and frozen meals are also available on national holidays. We do not deliver on holidays, such as Easter Monday this year because the church was closed. Today the church was having plumbing repairs done, so we were able to deliver out of the kitchen of Disciples Church on Mayfield Road. Speaking from my own experience, sometimes I am the only person these homebound seniors see all day. They are always happy to see me and bring a smile to my face. My favorite client in Solon always had a huge grin on her face when she greeted me. I learned several years later from her son that she had Alzheimer’s and had no idea who I was, but she was so happy to have food delivered. I have been lucky. If no one comes to the door we always call their home and if there is no response we then call the Office on Aging or Senior Center that oversees the program. Most of the time it is just a matter of having a doctor’s appointment and forgetting to cancel the delivery that day. However, some drivers have reported finding clients injured on the floor or even dead. I hope it is a myth, but I have heard of at least one senior waiting to commit suicide before the driver arrived so that their body would be found. The meals in Solon are/were picked up out of a retirement home cafeteria, and we provided our own coolers and bags. The hot meals were delivered in those big styrofoam take-out containers, so I had a large cooler to fit them all. The cold meals were bagged in plastic shopping bags. Cleveland Heights picks up from a retirement home and delivers the food to Fairmount Presbyterian, where it is portioned out and reheated in their oven. 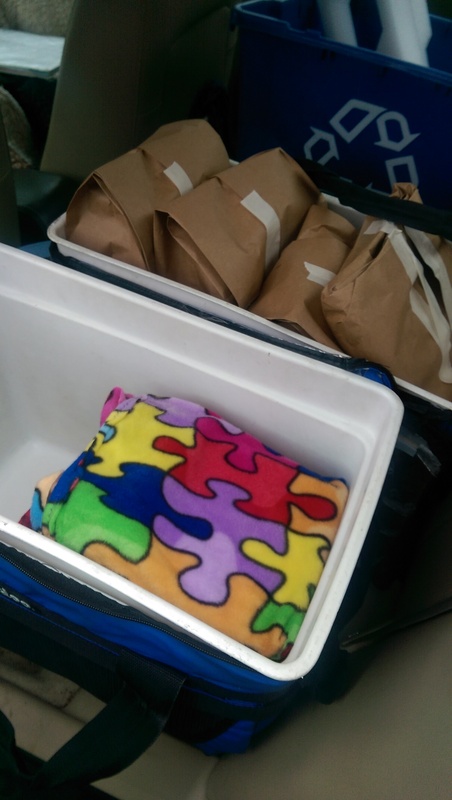 Cleveland Heights provides coolers and bags for the drivers, and the hot meals are delivered in handmade cozies to keep them warm. We return the coolers, bags, cozies and clipboard to the church when we are done. I have included some photos from today’s delivery, because I had a client who was not home. When that happens I am allowed to do whatever I see fit with the meals. I have been known in the past to give it to one of the homeless on Carnegie Avenue. I decided to eat it myself today (thanks Tax Day). The hot meal featured beef stew, rice and what I thought were beans but ended up being asparagus that was overcooked to an inch of its life (but still tasty). 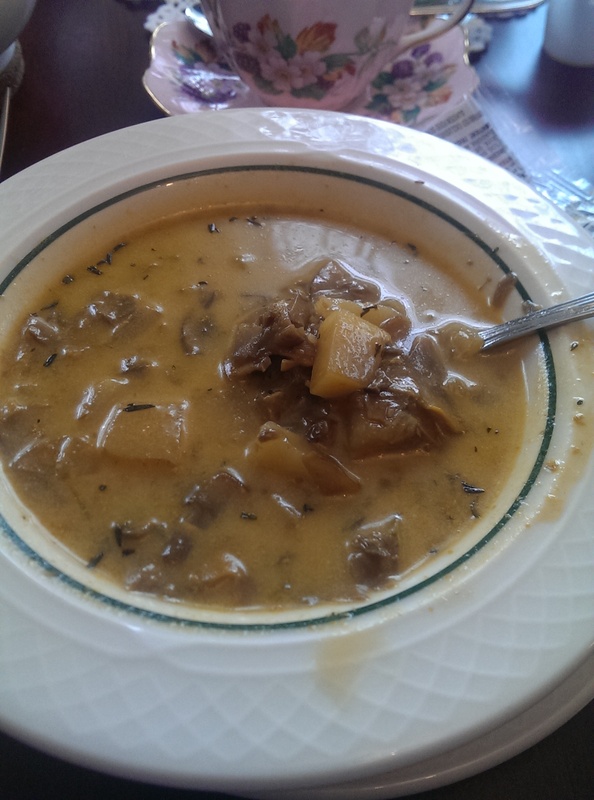 The beef stew was actually quite good. The cold meal is always a sandwich, a piece of fruit, a carton of milk, a dessert and some kind of side salad. Today it was a turkey and American cheese sandwich (with two slices of turkey instead of one – we had complaints) and mayo and mustard packets, a carton of milk, an orange, a slice of cake, and cottage cheese with a cherry tomato. The meals are always balanced and nutritious. At this moment, thousands of homebound seniors across America are on waiting lists to receive Meals on Wheels. If you would like to help, a donation could help us fight for the resources our programs need to serve vulnerable seniors. At the local level you could call the local senior center and see what they need. Our delivery coolers are getting pretty ragged, for example, and we are constantly running out of cozies. You can also volunteer your time picking up food, packing the food or delivering meals. I hope you forgive my indulgence today of spreading the word about Meals on Wheels. I know many people are not sure what it involves. Hopefully this little blog post helped. Thank you. 2016 is thankfully a thing of the past. Like in 2015, I decided to look back on the best things I remember eating this year. Money was a little tighter this year, so I had to cut back on my dining out. I cooked at home a lot, discovering the joy of microwaving 1/2 cup of popcorn kernels in a brown paper bag with just 1 tablespoon of oil and a few dashes of salt or butter salt. I made lots of pastas and soups as well as homemade pizza. Nick and Toni’s Penne alla Vecchia Bettola from the Barefoot Contessa was one wonderful discovery, as was my childhood favorite Slumgullion (aka Macaroni Beef). My Pampered Chef bakeware and electric pressure cooker saw regular use. It was the year I finally tried some iconic Cleveland staples – like Frank’s bratwurst at the West Side Market, the paczki from Michael Angelo’s Bakery, and the perch fish fry at Academy Tavern. I also revisited childhood favorites like the chicken foldover from Uncle Al’s Pizza and the shrimp with lobster sauce at Nam Wah (love their pho – best in town!). I also feasted on cheese for two days at Counter Culture, a two-day cheesemonger workshop sponsored by Culture Magazine. I fell in love with Vermont Creamery and Mackenzie Creamery as well as Losada olives there. I also traveled to Detroit (garlic paste at Lebanese Grill! ); Gettysburg (Friendly’s Peanut Butter Cup sundae! ), Philadelphia (Friday Night Meatballs with my friend and Serious Eats author Sarah!) and Lancaster (Amish food at Good n Plenty! ); New Orleans (beignets!) and San Francisco (dim sum and meals at the Slanted Door and Tadich Grill! ), but since this is a Cleveland food blog I will limit my best bites to here. These bites are the bites I will remember for quite some time. 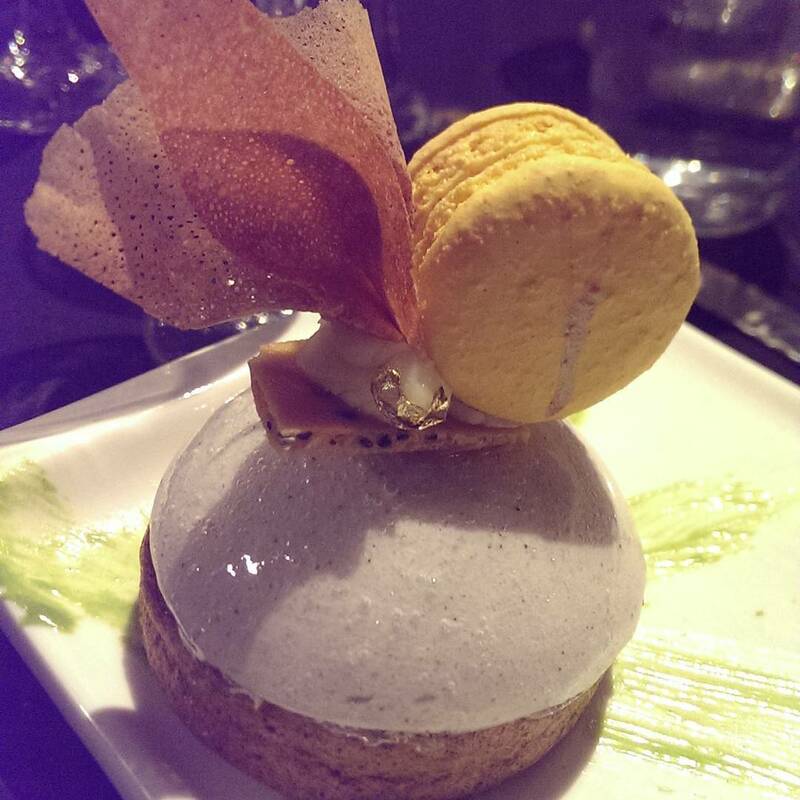 The new year started off deliciously with this amazing dessert at Dinner in the Dark. Paris goes Tokyo by Larissa from Coquette Patisserie featured green tea roulade, banana and black sesame mousse with black sesame brittle and honey-ginger macaron. It is not something I would have normally ordered, but I’m so glad it was offered as a course at Dinner in the Dark. I adored this dessert and had it again at Coquette later that week when they made it in the store. 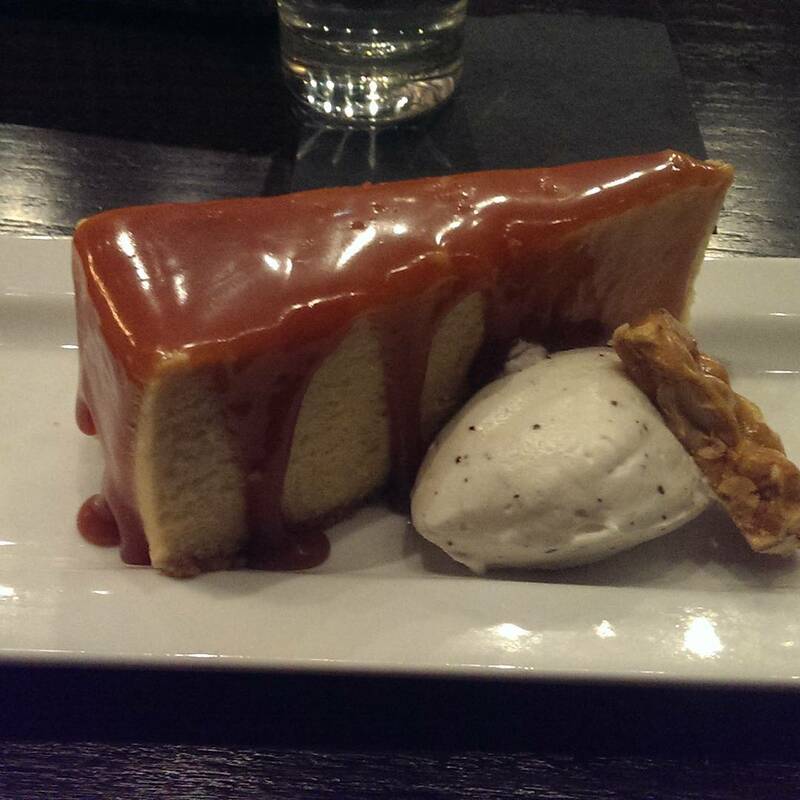 The salted caramel cheesecake at 111 Bistro was as delicious as it looks in the photo. I dined here for my friend Tom’s birthday. The food was once again amazing, but the dessert stole the show. The cheesecake was creamy, and it is impossible to describe the decadent salted caramel topping. The little side of ice cream and the little piece of brittle were a fun and delicious touch. MoMo’s Kebab opened on Lee Road and focuses on fresh Moroccan and Mediterranean food like kebab and fresh grilled vegetables. Back when I had their beef and vegetable tagine it was only available as a Saturday special. I believe tagine is now regularly available on their menu. Since it is cooked in a clay tower the meat and vegetables are unbelievable tender and succulent. My dining companion, who was married to a Moroccan at one point, had the prune and lamb tagine and also loved it. 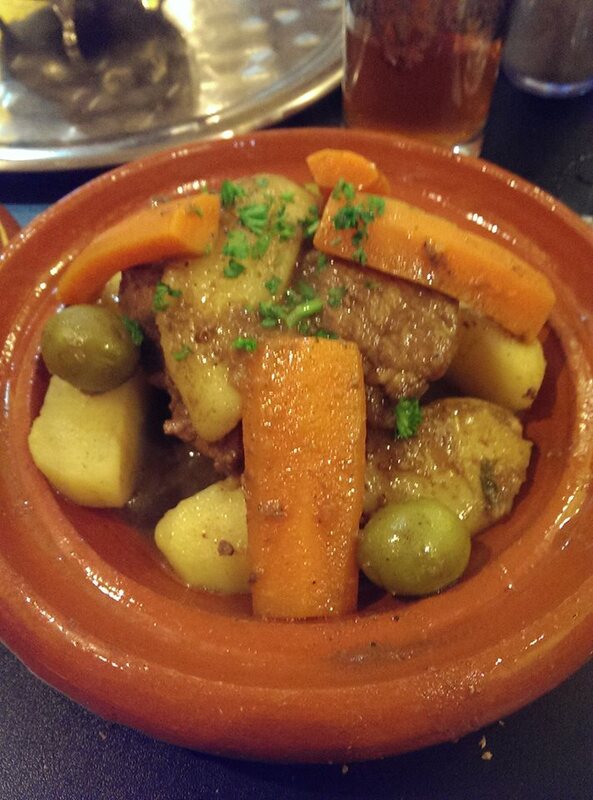 It was sweeter than my beef and veg tagine but just as tender. Be sure to order the mint tea! It is a wonderful ceremony. My tea group drives out to Sweet Shalom tea room in Sylvania every month. The menu changes based on the theme for that month. 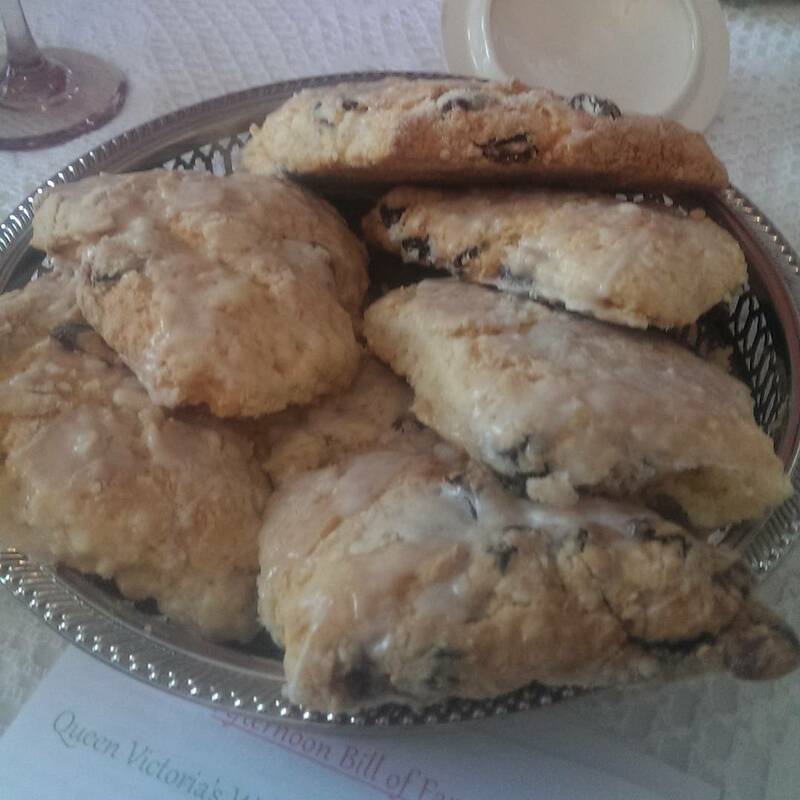 They have the best scones I’ve ever had, and these cherry almond scones are by far my favorite. The scones are huge, yet light and flaky. They are usually accompanied with butter and jam or preserves, but these cherry almond scones are amazing just as they are. A new tea room opened in 2016 in an old farmhouse from 1890 on the village square in Twinsburg. Greenbridge Tea House is a vegetarian and vegan tea house. They are open Wednesday through Friday from 11 to 3 and Saturday from 9 to 3. This golden mushroom and potato soup smelled divine, and I was so happy that I ordered a bowl of it instead of just a cup. Their crustless quiche and garlic bread were also delicious, but the soup stole the show for me. Coit Road Farmer’s Market is a farmer’s market in East Cleveland that supports the local community. They are open on Saturday mornings in the winter and Wednesdays and Saturdays in the summer. The market manager Kevin is a great cook, and they offer cooking classes to teach customers how to use and preserve produce, cook with cast iron, and cooking skills like knife skills, etc. This year they taught folks how to make spring rolls, sausage, mole, and traditional Chinese cooking, just to name a few. This weekend Kevin is going to show how to put together a sous vide set-up from parts on eBay for $30-40. Their special fundraising meals are always a good time. For a very affordable donation that goes to the market customers can enjoy the food in a casual setting. 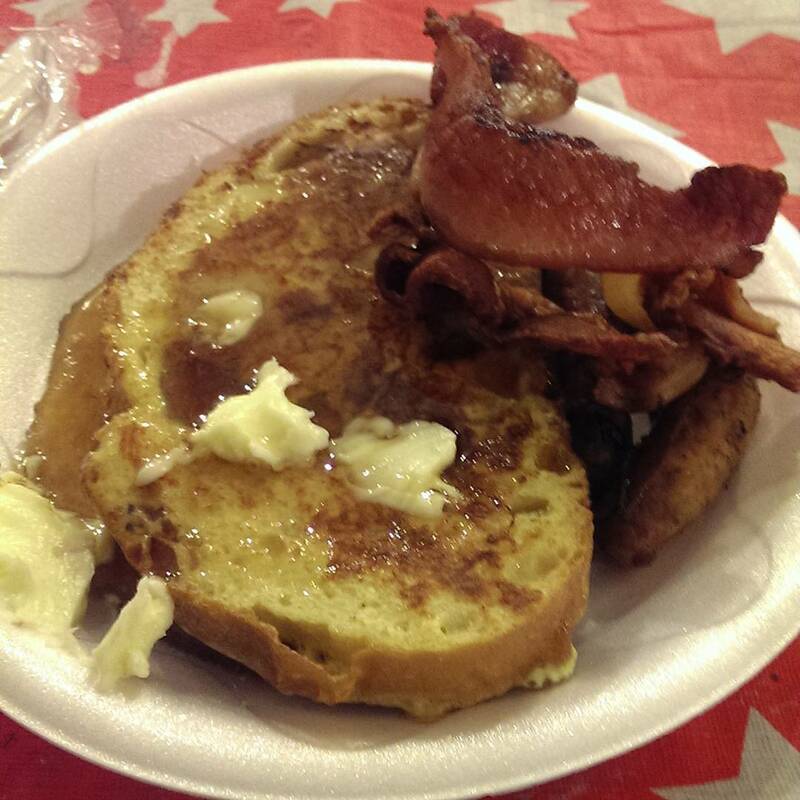 They served pizzas and had several corn roast and BBQs this year, but one of my favorite bites was their French toast and bacon in April. I don’t know what they put in the batter, but it was delicious. Batuqui opened on Larchmere a while ago, and I finally got a chance to eat there in 2016. I don’t know what took me so long. The food is delicious, but their seafood stew really won my heart. 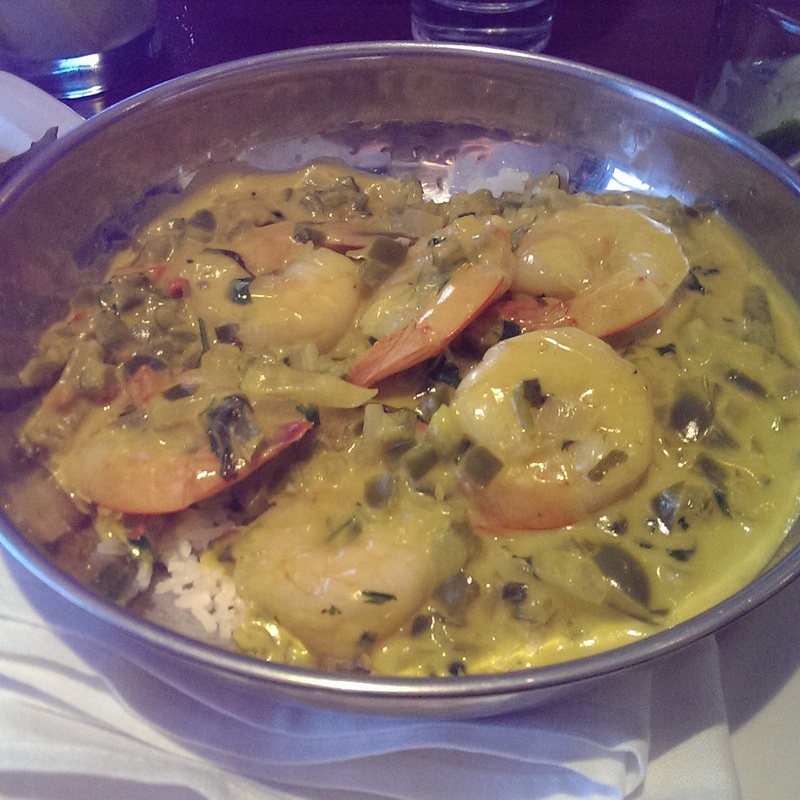 Fresh shrimp cooked in coconut milk and curry served over rice. I loved every single bite. Plus, they serve amazing caipirinhas. I really need to get back there more often. On a whim in the early days of summer I stopped at Strickland’s Custard in Streetsboro and started off a ice cream and butterscotch craving that I still cannot shake to this day. 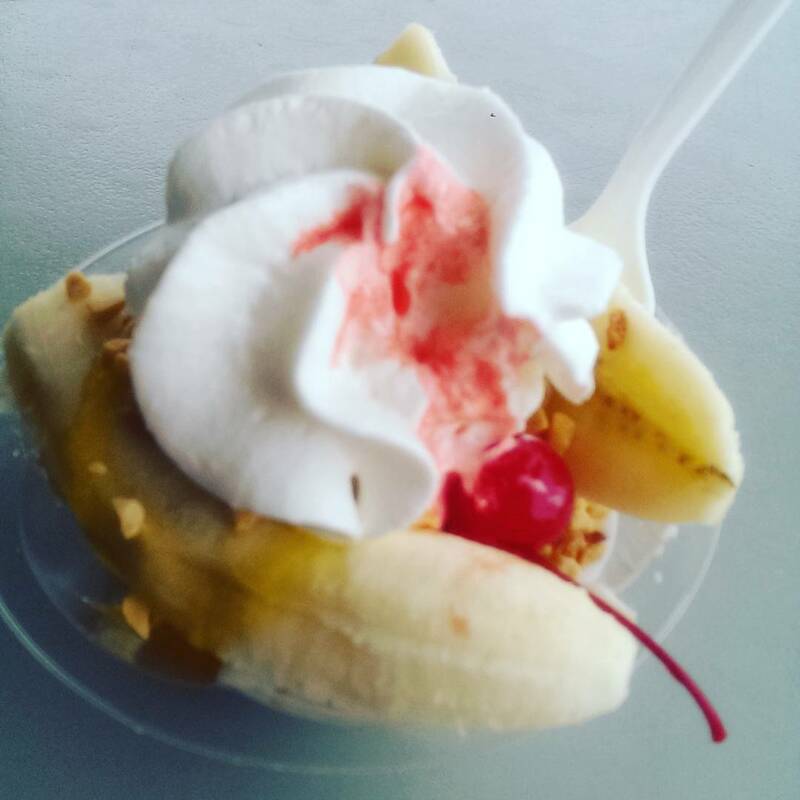 I ordered the Banana Bowl, which features half a banana, vanilla soft serve custard, topping (obviously I chose butterscotch), whipped cream and a cherry. I love the combination of banana and butterscotch, which I would have normally not put together. The photo doesn’t do it justice. Fat Casual BBQ took over the patio at Graffiti: A Social Kitchen this summer and served their amazing smoked meats and grilled goodness. My friends and I went for the smoked prime rib, which I enjoyed with their polka fries (spiral sliced potatoes fried and smothered in cheese sauce and bacon lardons). 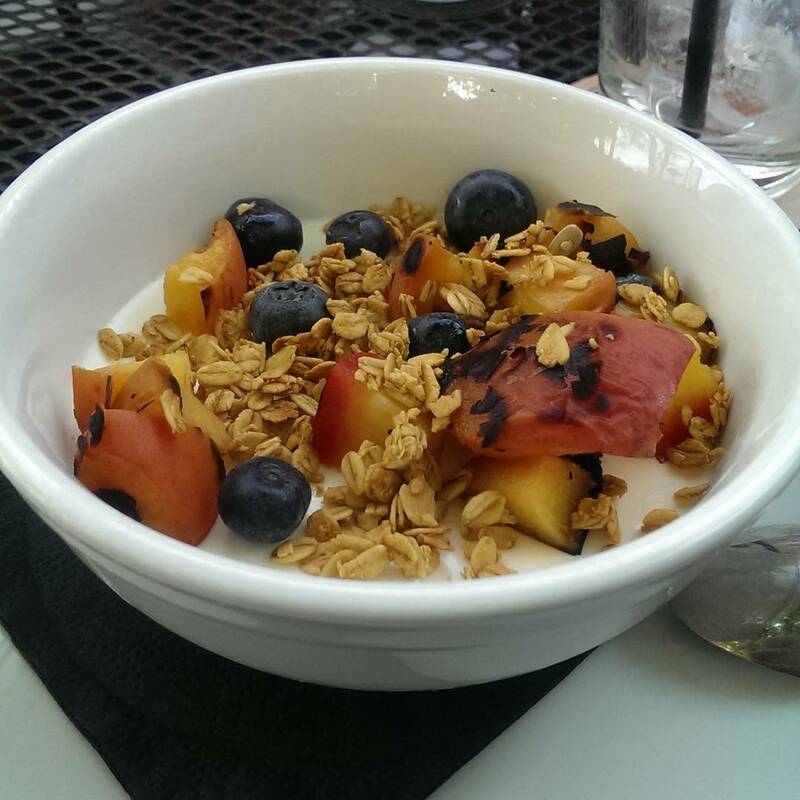 But Graffiti’s cereal milk panna cotta with grilled peaches, blueberries and granola stole the show that night. If I could have licked the bowl clean I probably would have. A delicious meal from start to finish. They offer their cereal milk panna cotta on the regular menu, but it isn’t available with grilled peaches. 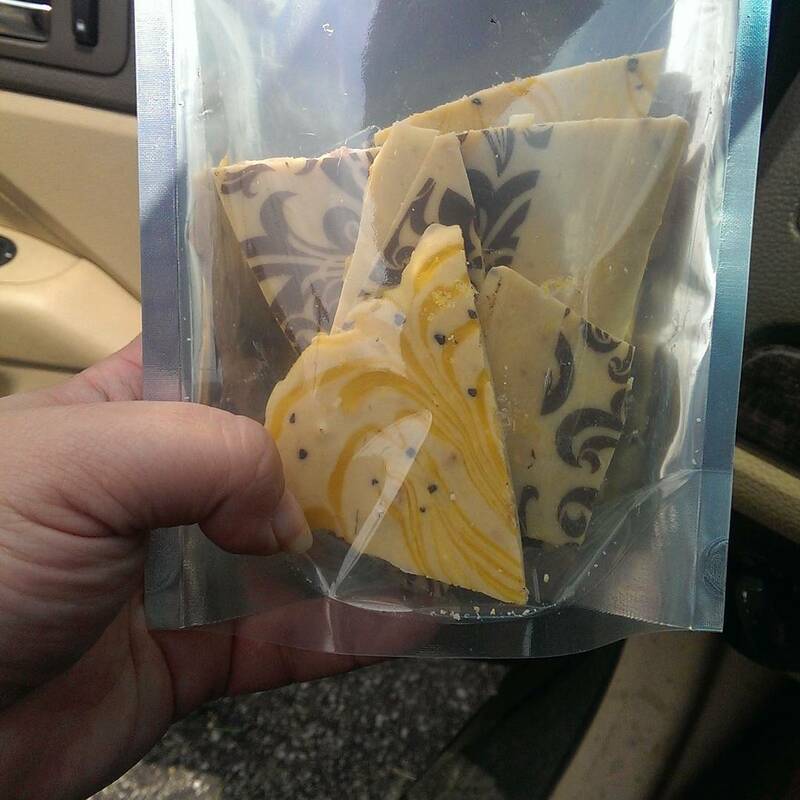 Lilly Handmade Chocolate always has amazing chocolate flavors, but their Dreamsicle Bark hit my sweet spot. I love the flavors of orange and vanilla together. I’m not normally a fan of white chocolate, but I absolutely adore Lilly’s white chocolates, especially the Maui Wowie. I attended several chocolate and beer tastings at Lilly’s this year and had some amazing bites like the passion fruit panna cotta, but this Dreamsicle Bark was exceptional. Taj Indian Palace has won my love for two main reasons – one) their peas and mushroom entree and two) their masala dosa. I never understood why people loved dosas until I had theirs. Most dosas were crispy with just a minimum of potato and onion filling. 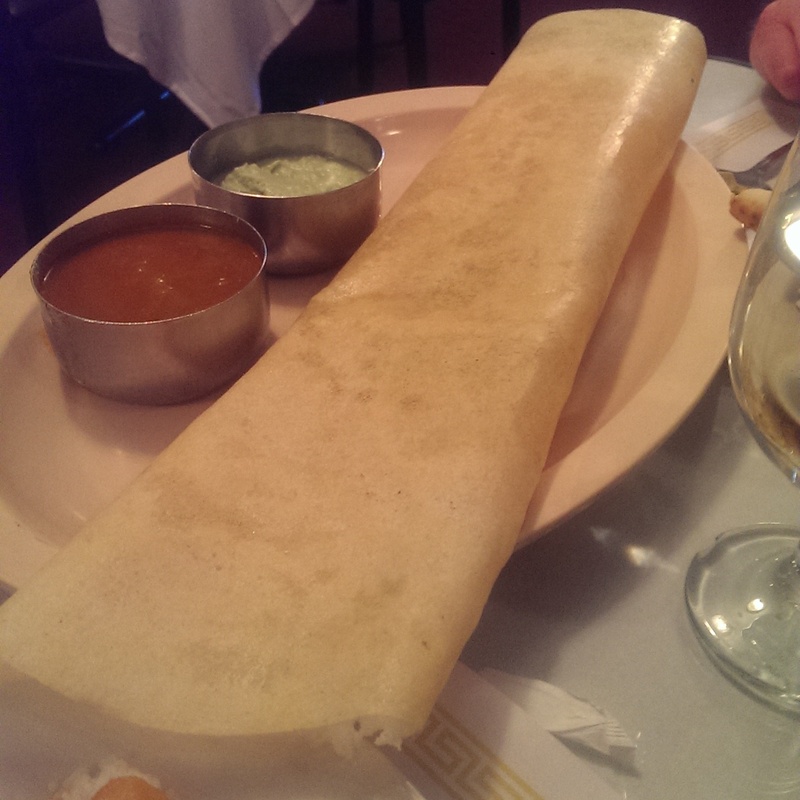 Their dosa is buttery, filled from top to bottom and just amazing. I met some friends for dinner here and ordered the peas and mushrooms because I was craving mushrooms. 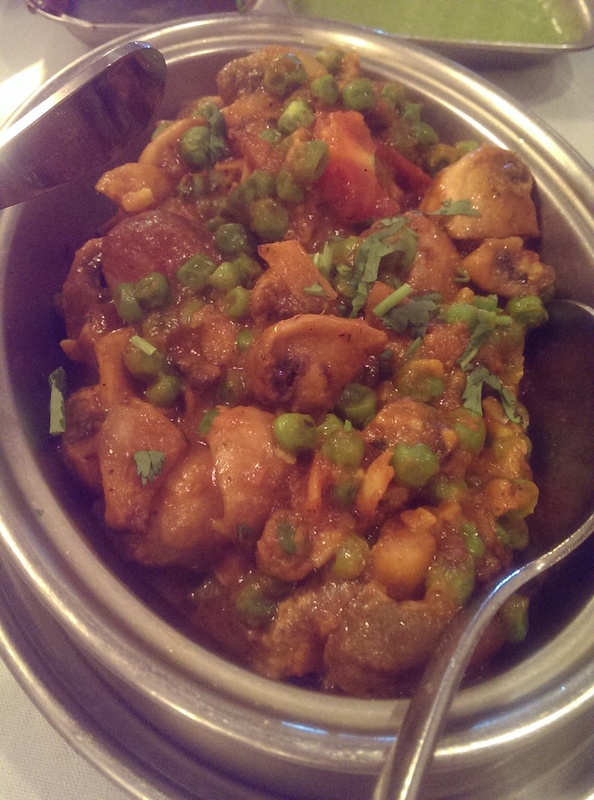 I loved this dish more than the saag I also ordered. I’ve been back numerous times in 2016. It’s my go-to Indian restaurant now. They also have a lovely lunch buffet. One of my favorite festivals is the Night Market. From May to September one Friday a month features Asian cuisine and culture in a lovely open-air market setting. Since I love Asian cuisine I thoroughly enjoy wandering through the tents and nibbling a bit from here and a bit from there. Established restaurants like Li Wah and Emperor’s Palace as well as start-up vendors like Snow Brothers and anyone who wants to offer Asian cuisine can sign up for a tent and sell their wares. I learned about vendor Ice and Rice through a friend. Andy Ng is a civil engineer who moonlights as Night Market vendor Ice or Rice with his wife, Jessie, a graphic designer born in Guangzhou. 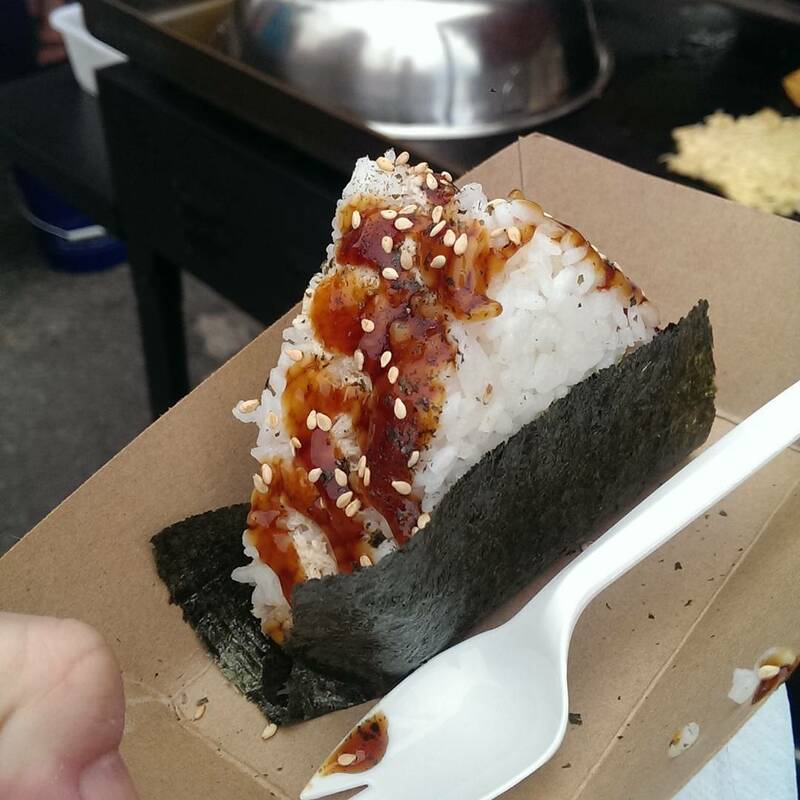 Their food is great, and their tuna onigiri is definitely one of my favorite bites of the year. The creamy tuna salad combined with the Asian sauce and tender rice to make one delicious bite. Jill Vedaa opened Salt+ in Lakewood, which features small plates as well as great cocktails and unique wines. I met some friends there in August and we enjoyed a variety of small plates. 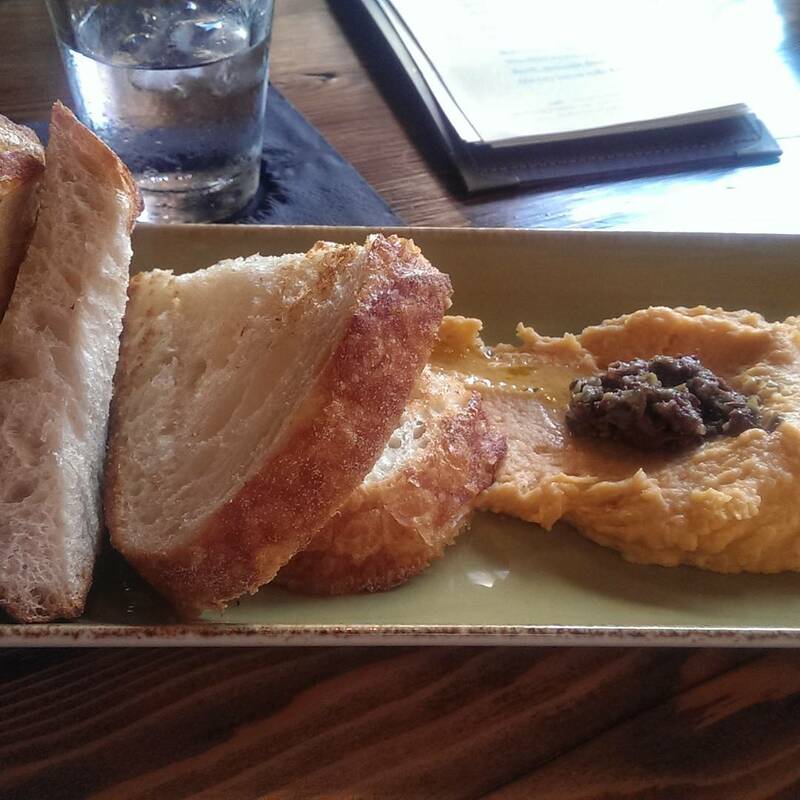 The smoked trout and grilled octopus were nice, but my favorite plate was the white bean puree with mashed olives and lightly grilled bread. It shines probably due to its simplicity. Just clean flavors that shine. 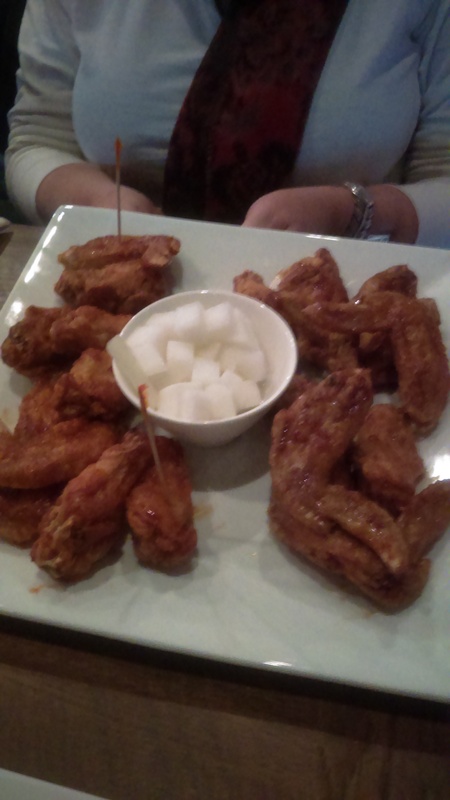 Bonchon recently opened in Seven Hills and serves the most amazing Korean style fried chicken and wings as well as Korean and Asian fusion cuisine. Choices like Japchae and Bibimbap as well as udon, shrimp shumai and fried rice are just some of the choices. But the fried chicken and wings are king. We were there during their soft opening, and I’ve been meaning to get back there. The wings are double-fried and served with either a spicy or garlic soy sauce. A friend and I split the medium size wings and went with the half and half, which features both sauces. The spicy sauce was amazing and not so overly spicy that I couldn’t eat it. My lips had a nice burn, but it was so addictive I kept wanting more. The wings are served with a side of pickled radish to somewhat mitigate the heat. 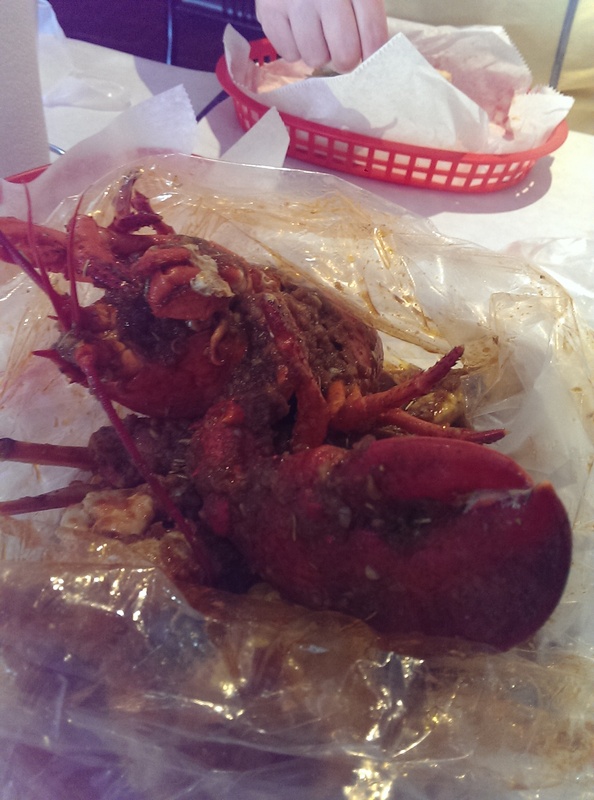 Last but not least, Boiling Seafood Crawfish on Lee Road offers boiled seafood like crawfish, shrimp, lobster and crab in your choice of sauce. The corn fritter appetizers and po’ boys are good, but the boiled seafood is clearly the star here. I made my own, choosing lobster and crab legs along with the requisite potato and corn. I chose their Juicy sauce, which is a mixture of all the sauces they offer (Cajun, lemon pepper, and garlic and herb). It was messy deliciousness that I crave constantly. I hope you enjoyed reading about my favorite bites of 2016 and are inspired to go out and try some of the places I’ve talked about. It seems like dessert played a big part of 2016 for me. I made a sweet tea vodka and fresh peach tiramisu for my tea group’s summer picnic this year. 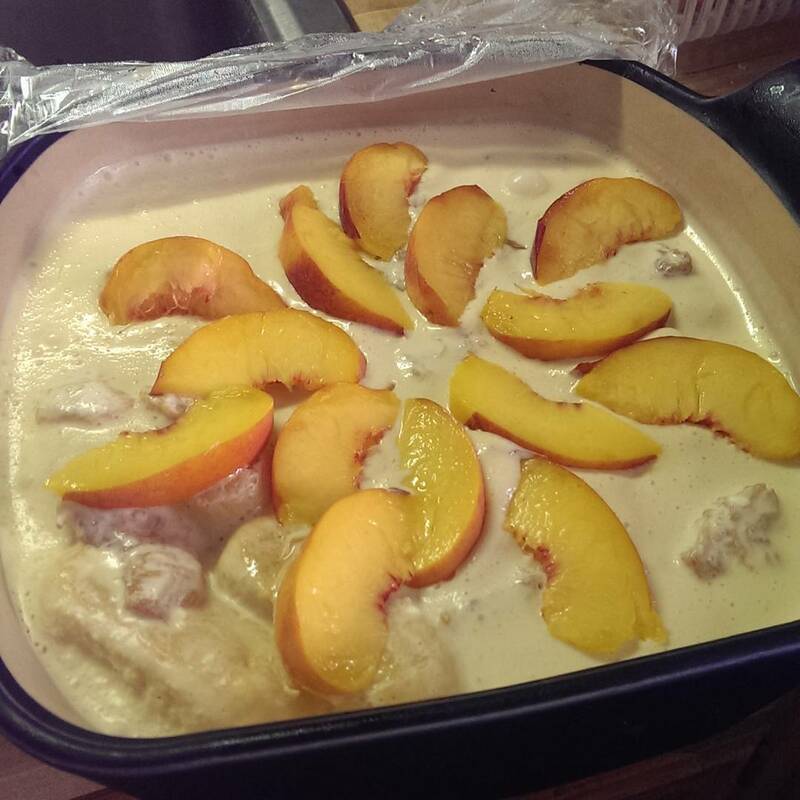 I riffed off the Barefoot Contessa’s rum raisin tiramisu and used sweet tea vodka since tea was supposed to be an ingredient and I was overrun with peaches from the Georgia Peach Truck. While making it, it looked like a huge disaster, with the sweet tea-soaked ladyfingers floating in the cream sauce, but it was probably the most delicious tiramisu I’ve ever had. Everyone enjoyed every boozy, creamy bite. Here’s hoping 2017 brings lots of delicious bites as well! Grilling is a pastime loved all over the world. I enjoyed many a summer evening grilling in my backyard or along the Rhine when I lived in Germany. 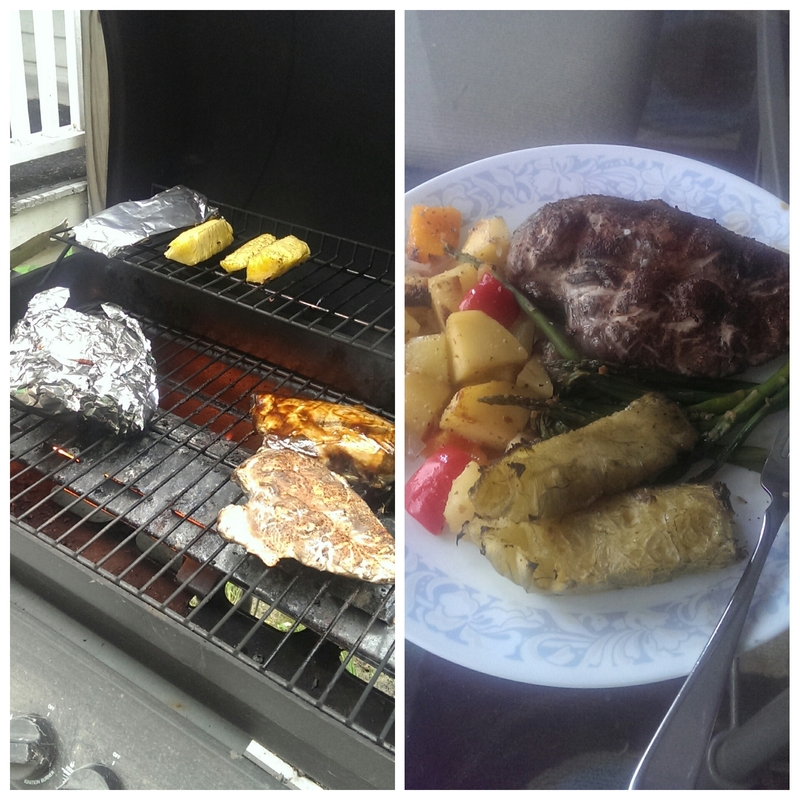 I grilled this year for the first time last night. It felt so great to roll the grill out of the garage and fire it up. My mother grilled all the time growing up (and still does). She primarily grills the meat and serves side dishes out of the kitchen. Since I grill much less than she does it is more of a production. I cut up potatoes, onions and peppers coated in olive oil and seasoning and wrapped in foil along with a couple of chicken breasts, asparagus with garlic and soy sauce (also in foil) and pineapple slice. Of course I forgot to throw the corn on, which was the whole reason I decided to grill out in the first place. 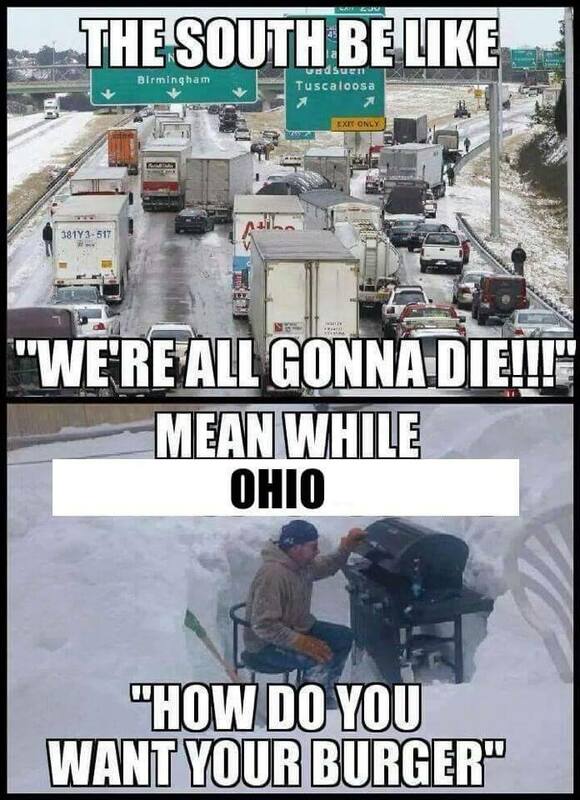 But we Ohioans are hardy folk and some grill all year. Lawson’s Chip Dip remains a huge favorite to so many people in the Great Lakes area, and it’s only available at Circle K gas stations and The Lockview restaurant in Akron. 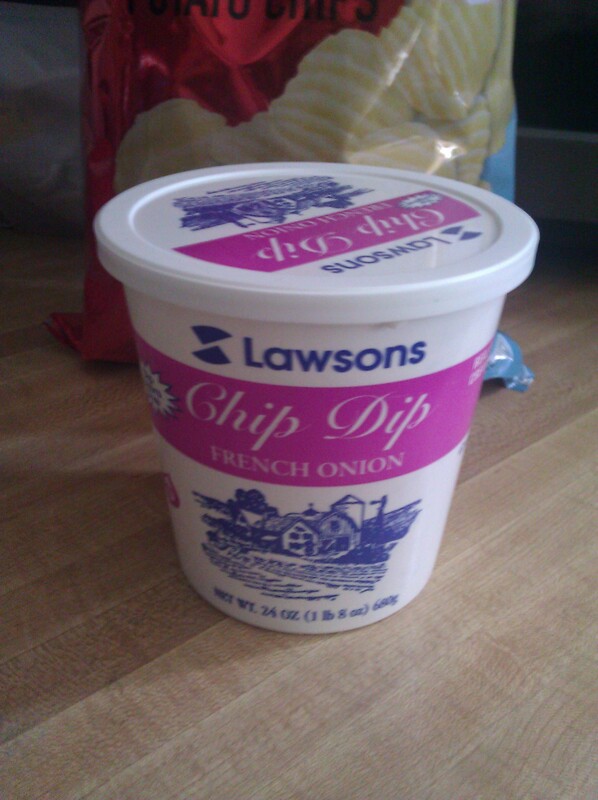 When I was growing up the only chip dip to serve at parties was Lawson’s Chip Dip. Lawson’s started in 1939 when dairy owner J.J. Lawson started a store at his Broad Street dairy plant in Cuyahoga Falls to sell his milk. The Lawson’s Milk Company grew to a chain of stores in Ohio and was bought out by Consolidated Foods in 1959. Lawson’s convenience stores were common in Ohio from the 1960s through the mid-1980s. Lawson’s stores were sold to Dairy Mart, and Circle K bought Dairy Mart in 2003 and kept the Lawson’s products. I had to get gas today because I was getting a Low Fuel Level warning, and the cheapest gas around was at the Circle K in Solon. I knew I needed to indulge in some Lawson’s Chip Dip for old time’s sake. The refrigerator case held three sizes, the largest being 24 oz (1 lb 8 oz). Circle K also sells Lawson’s ice cream and other dairy products. The chip dip is a French onion dip and isn’t as oniony as dips such as, say, Helluva Good Chip Dip. The flavor is very understated, and the dip is creamy. So if you are like me and want to indulge in a childhood craving, be sure to check out the refrigerator section of your local Circle K gas station and convenience store. They say imitation is the sincerest form of flattery. Eat*Drink*Cleveland often has an “(Almost) Wordless Wednesday” that I enjoy, so I hope she doesn’t mind that I am borrowing the idea this morning. 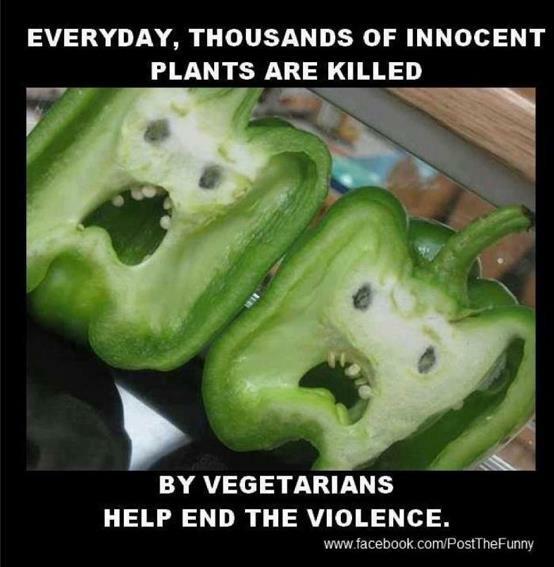 This was too funny not to share. My New Year’s resolution is to post more! ﻿I have been woefully remiss in posting here, but I have every intention of changing that. My New Year’s resolution is to start posting here again. 2010 was a crazy, crappy year for me. 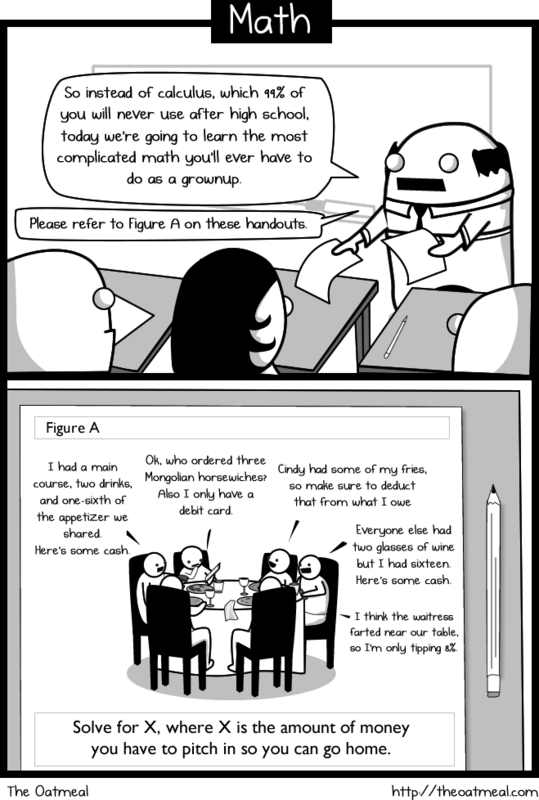 The translation industry has boomed and kept me very busy. When I am not working I try to stay off the computer as much as I can. I am still going out to eat, but I just need some motivation to write about it. I have the annual blog stats to thank for this prompting. I had no idea this blog had been viewed 8,000 times this year (with only 2 new posts). I need to step up my game! I will be posting on Empress Taytu later today. Keep your eyes peeled… and thanks for sticking with this little blog despite my ignoring it this year. Author Jill (@bonnjill)Posted on January 5, 2011 Categories Random musings2 Comments on My New Year’s resolution is to post more!